Søstrene Grene (the Grene Sisters) opened recently at the shopping center near us. Hallelujah to Jesus. I went into the store to pick up a few small things to send in care packages to some friends of mine. While I was browsing and trying on some reading glasses, I noticed that someone had left a kids' item in a random spot – either they'd changed their minds about buying it and didn't bother putting it back (yes, I've been guilty of this), or they'd set it down to look at something else and then forgot to pick it up again. 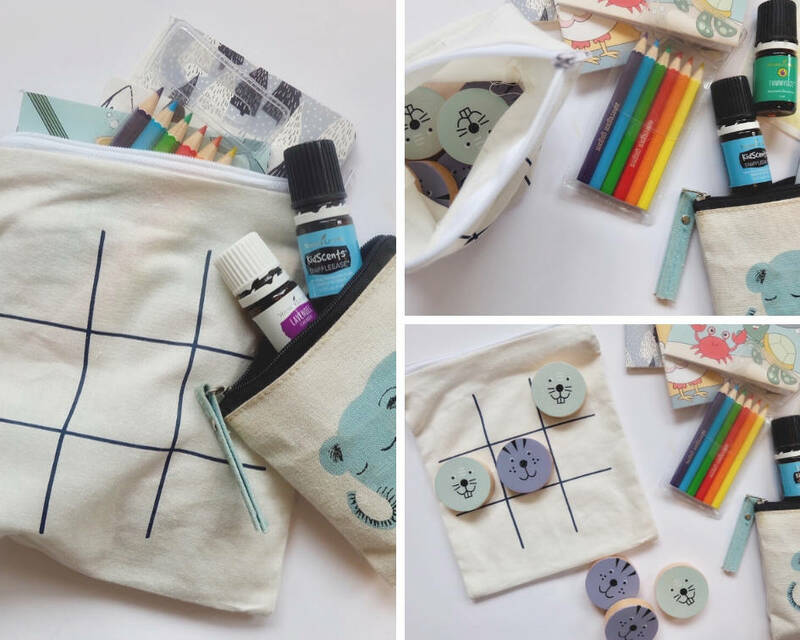 Either way, there it was – a little cloth bag with a tic-tac-toe board on it, including six little animal-faced wooden discs. A mini-pack of colored pencils. Should I get two? Nah, they can share. Check. Two mini coloring books. Check. Two blank notebooks. Oh, these are so cute. Check. And the bag itself is a game, so… oh wait, let's throw in some bandaids. Or should I find some stickers? No the bandaids are more functional. And we never have bandaids when we need them. Okay good, we're done. The bag is small; don't overdo it. 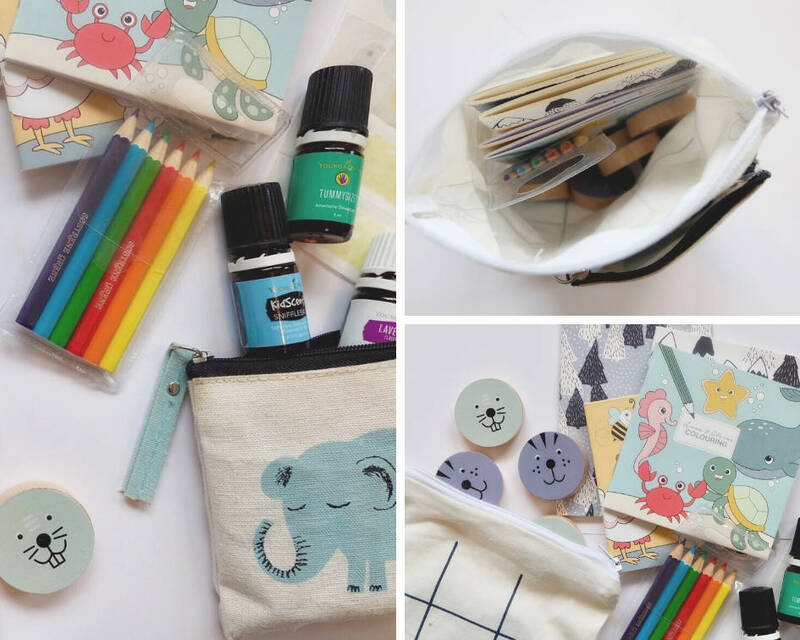 When I got home and put it all together, I realized I was missing just one thing to make up the perfect busy bag/travel pouch for my boys – essential oils. We don't go anywhere without them anyway; now they'll just be living in a different spot in my mom bag. TummyGize, SniffleEase, and Lavender had already been hanging out in a cute little elephant pouch (surprise! from the same store!) that I always keep in my purse, so I just transferred it to the busy bag. I love to travel, but let's admit it, moms… traveling with young kids does take some of the fun out of the whole experience, on occasion. Now I'm actually excited for the next time we find ourselves twiddling our thumbs, begging for a new app on the iPad, or whining about how bored we are on a train ride… to France, maybe? Italy? (Just throwing some suggestions out there.) Or even for the next time we're stuck in a waiting room or are ever-so-impatiently awaiting a meal at a restaurant. 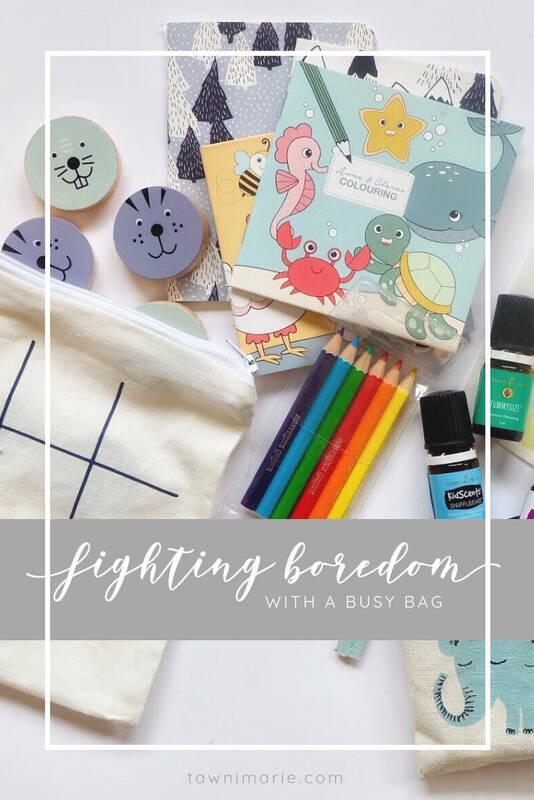 Whatever it is, when the time comes, I'll be armed and ready with this cute little busy bag to shove in the boys' faces, like a magician pulling a rabbit out of a hat. Voilà. Then my husband and I will roll a little bit of Stress Away on ourselves (because obviously I bring that with me everywhere I go, too), we'll sit back, give each other smug, satisfied looks, and together we'll all ride off into the sunset. 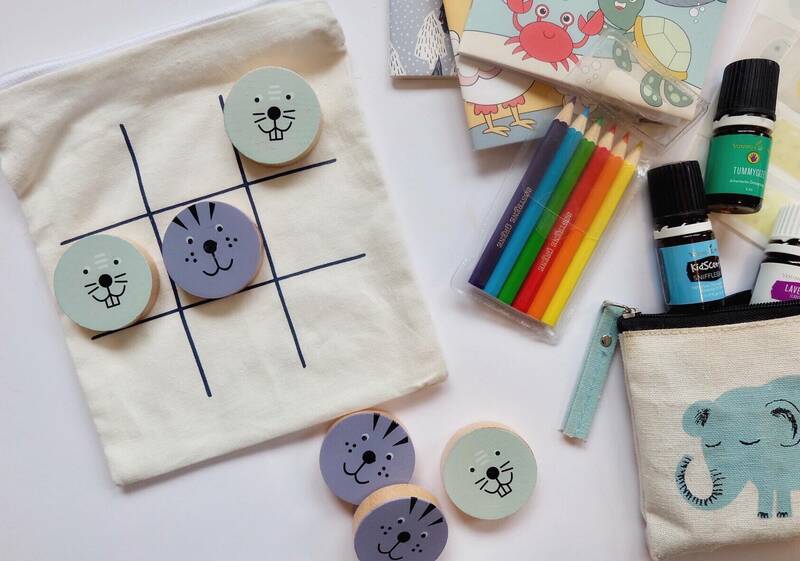 If you've got a busy bag for your kids, what sort of things do you keep in it? Do you switch the contents out often to keep things interesting? I'm thinking maybe a hot wheel or two, or a couple of mini dinosaur figures might make their way into our bag at some point. Experienced oilers: what is the ONE OIL you cannot leave home without? Learn More and Change Your Life: Read more about how/why our family uses essential oils by browsing this very site, and when you're ready to get your own kit and save your sanity, click here to order your Premium Starter Kit and join our group of relatively oily folk! I'll be your personal mentor and sponsor throughout your wellness journey. Hey there! I'm Tawni. You can usually find me with a book in my face and a cup of coffee in my hand, pretending not to hear my boys playing Lego-dinosaur-superheroes as loud as humanly possible on the floor in front of me. I’m passionate about books, plants, cats, alone time, and educating and supporting others who have an interest in what it means (and what it looks like) to live cleaner, more natural, “relatively oily” lifestyles. I'm currently taking courses to become a certified Health Consultant and Vitality Lifestyle Coach, and I can't wait to put that knowledge into practice! I understand that essential oils are not the only answer, but I believe that they're an important piece of the puzzle. My family uses essential oils for many different things, and we've been able to effectively and easily integrate them into our daily life to promote natural wellness in our home. I want to use this space to show you how you can easily do that, too. It doesn't have to be weird. I share occasional tips on essential oil usage on Instagram and Facebook, and I invite you to join the Relatively Oily Public Community here on this site to learn more and become a part of our growing group of friends. t a w n i m a r i e .
Copyrights © 2019 held by respective copyright holders, which include but may not be limited to GetOiling.com and t a w n i m a r i e ..